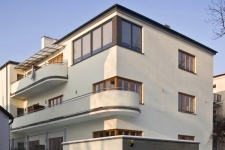 Functionalist style villa designed by Stefan Koziński and Leon Mazalon in 1936. Its corner windows, asymmetrically arranged balconies with rounded edges, bright walls and flat roof give the building a really modern character. Initially, in the corner of the building there was an incised roofed terrace, at present glazed with big stretches of windows it became a part of the living-room. The wall which used to divide the flat was knocked down and only one corner pillar was left.